Each day is comprised of different moments- some happy, some sad, some serious, some absurd. Likewise the thoughts, actions, and emotions that are experienced while visiting monuments and graves, sharing historical research, exploring museums, and commemorating the losses and victories of war cannot be contained in a singular fashion. At certain points, words cannot even describe the response to remembering these parts of the past. The different locations and stories surrounding each site is a study of contrasts. This stems from the choices made when developing the memorials, as well as the nature of each battle itself. There is a constant division between the bustle of everyday life, and the areas designated for peace and reflection. This is not the first day I have visited a cemetery, stood before a grave, or read a commemorative plaque. The past few days have been filled with standing on or near battlefields and monuments. And I still cannot reconcile the peace of each site (rain, winds, fog, and other forms of extreme weather exempt) with the knowledge of the chaos, violence, and turmoil that occurred in the same spot a hundred (or so) years ago. Perhaps we are not supposed to. These thoughts, ever present, were particularly strong in the second half of the day. In the morning, we visited Monchy-le-Preux, the Canadian Battlefield Monument at Dury, Canal du Nord, Ontario Cemetery, and Burlon Wood. At the very end of the day we spent some time at the Wellington Quarry. In between these stops, we went to two cemeteries: the German Military Cemetery at Neuville-St.-Vaast, and the Cabaret Rouge Cemetery. 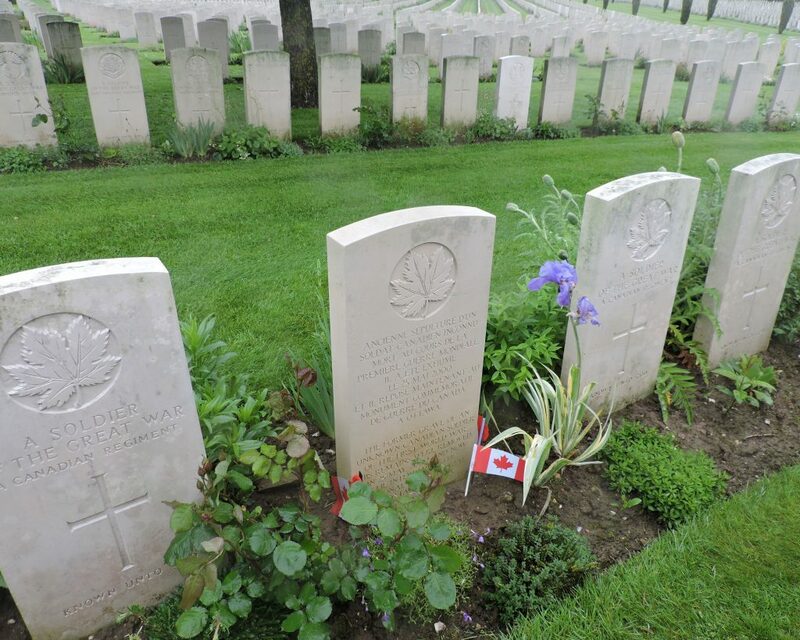 At Cabaret Rouge there are over 7600 graves, one of which is a placeholder for the unknown Canadian soldier who is in a special tomb at the National War Memorial in Ottawa. The cemetery, with its white stone, freshly mowed lawn, well kept plants, and clean lines is a stark contrast to its namesake: a small red café, with a wild garden, that fell to shellfire and trenches. While over half of the graves are of unknown soldiers, the rest have the names of soldiers, and some of those individual inscriptions. In a line of graves, the quote “Their glory shall not be blotted out” was repeated several times- a sentiment that speaks to remembering the efforts of those who died during the war. One of the graves next to them, however, said “He died for me” a rather more personal view, yet one that speaks volumes. 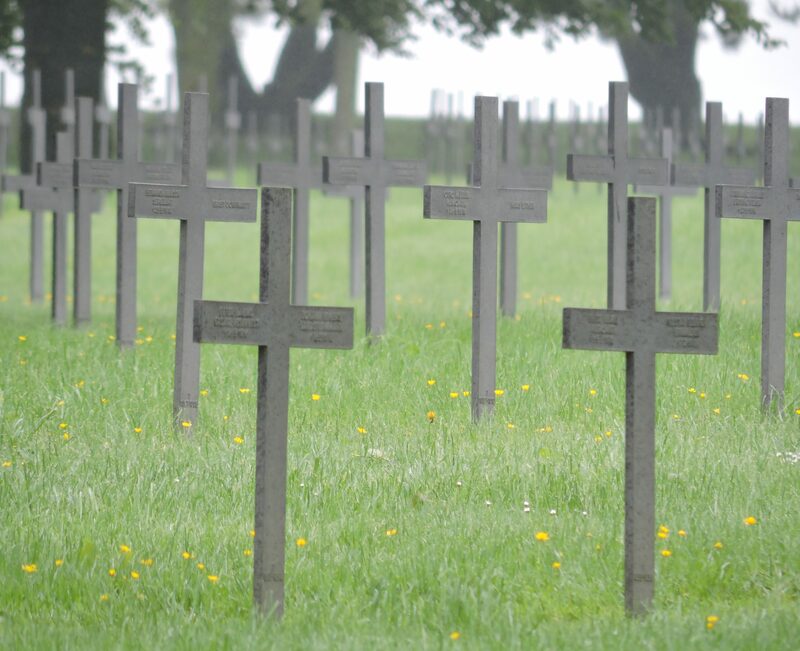 The German Military Cemetery at Neuville-St.-Vaast contains about 44830 German soldiers. You can see the crosses while driving, however, stepping through the cemetery gates and walking among the crosses is another experience entirely. The sheer number of dark, minimalist crosses is overwhelming. There is a monument, large stone map of battles in the area, and the cemetery is well kept and contains paths amidst the trees and greenery. The expanse of markers, which usually contains one name on each side of the cross, can only begin to signify the lives lost throughout the war. The sign at the beginning of the cemetery contains the Albert Schweitzer quote, “The soldiers’ graves are the greatest preachers of peace.” And spending time in this cemetery, as well as the others we have visited, I cannot help but agree.